Don’t stress over organising your wedding! It’s your day – remember that! 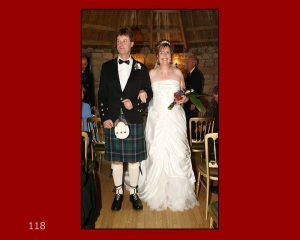 When my husband and I got married, we lived in New Zealand but wed in Scotland! Now that I am working in the wedding industry, here are a few tips and ideas which helped us when we needed them! I know everyone says it, but don’t stress! Stressing can ruin the whole fun element of organising this special day – there will be things which happen which you won’t like – but take a deep breath and know that there is always an alternative. Do what you want to do! So many times I hear people say “we need to do that because so and so had it and we don’t want to look cheap/boring/out of touch etc”. Remember, it is YOUR day and you must make it what you want. Set your budget and stick to it! It doesn’t matter how much or little you spend – you can achieve everything you want within your budget – don’t get swept up in the wedding fever. You can use anything, it doesn’t have to be designated as wedding stuff to be something beautiful and what you want. You can achieve great things with little money if you plan and are prepared to do a little bit of work yourself. We did most things ourselves – our table decorations were coloured candles in cheap and cheerful metal pots (using the colour themes) and then the table was decorated with rose petals and paua (abalone) shell from New Zealand. The effect was lovely but cost very little. This is just one example. We agreed the things we wanted to spend our budget on (entertainment and the food) and looked at doing as much ourselves as we could for everything else. Things will challenge you. For us, our florist went out of business three weeks before the wedding, leaving us to find another one from 13,000 miles away! We were able to speak with our photographer and venue and ask for recommendations – and had the most beautiful flowers. Don’t be afraid to ask for advice. Talking to your venue and other suppliers will give you an idea of people they have worked with before and can recommend. On the day, take everything in your stride. If things don’t go quite as planned you are the only one who will know and everyone will love the day regardless. And finally, enjoy the day. It goes by so quickly that if you are stressing about everything your memories won’t be the ones you want. Copyright © 2019 First We Eat. Powered by WordPress. Theme: Accelerate by ThemeGrill.